Most Christians remember the Last Supper if not day after day, certainly month by month all year round. But we focus on foot-washing only once a year, and rarely is it enacted. It has become more of a metaphorical memorial than a real presence. 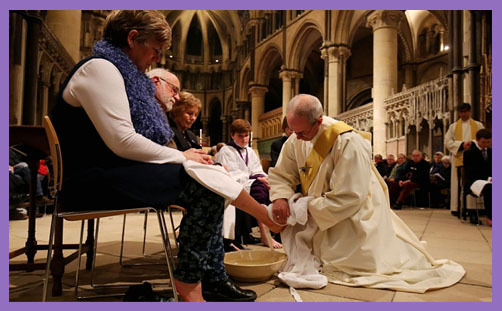 Perhaps we should precede every celebration of the Eucharist with foot-washing or a modern equivalent; a little induced humility to dispel superiority and confront our pride. After all, we all need to wash our feet: having someone perform for us a necessary act of ablution without expectation of payment would be a manifestation of humility and service. And we all need to eat, but the bread and the wine are privileges. Only if we are humble can we dine with Him; only when everything else fades into oblivion can we feed on Him. And that was – and is – the truth that power constantly needs to be reminded of what it’s for. Power exists, in the Church or the state or anywhere else, so that ordinary people may be treasured and looked after, especially those who don’t have the resources to look after themselves. The Bible is crystal clear that this is the standard by which the gospel of Jesus judges the powerful of this world. Power needs to be reminded of what it’s for. Mutual foot-washing helps to do that, especially when those feet belong not to your lovely and lovable family and friends – or to those who vote for you – but to people you despise, resent or loathe. Perhaps George Osborne might wash the feet of some disabled; or Nigel Farage might do the same for a few economic migrants; or Jeremy Corbyn for the editor of the Jewish Chronicle. Or is that to politicise a sacred ritual, and risk media flashpoints of ‘my foot-washing is more humble than yours’? The Messiah washed the feet of Judas. The Lord served His disciples. When power is brought to the feet of its subjects, we reach the essence of the gospel of love. We’re all struggling to pass through this dying world. Some do it with love, grace and humility; others prefer to quibble over the customs of Israel in AD33. The sandals of doctrinal rectitude trump hospitality, charity and humility. Perhaps the Church might look to the example of St Benedict, who directed that foot-washing should be performed every Saturday for all the community, by the one acting as cook for that week. It was also directed that the Abbot and Brothers were to wash the feet of guests. These acts were accompanied by prayers and hymns. We all possess power over someone or something. If it is not subordinate employees, it is younger family members. If not them, it is our troubled neighbours or anxious acquaintances. If not them, it is the dog, cat or hamster. It is good for the soul not only to read about humility, but to practise it. It may be humiliating, but if we do not feed on Him by faith, and pray as He did in the garden of Gethsemane with grief and tears of anguish, then our hour will never come: the cup of suffering passes us by, and believers will never be one.